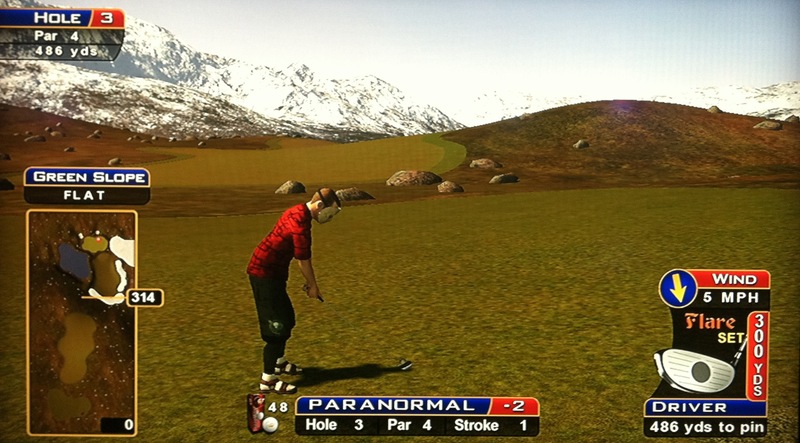 This section breaks down how to play each hole at Golden Tee’s Summit Lakes, which was voted the 3rd hardest of the 2008 courses by the expert community. 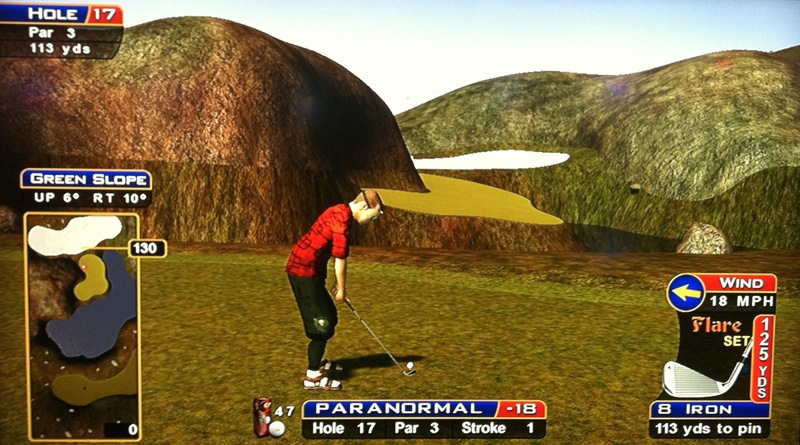 The par 3 17th hole got multiple votes as one of the toughest holes in Golden Tee Live 2008, and holes 10 and 13 also got votes for being among the hardest. When you’re done reading, click here to download and save a printable version of these tips that you can take to the bar while you play! 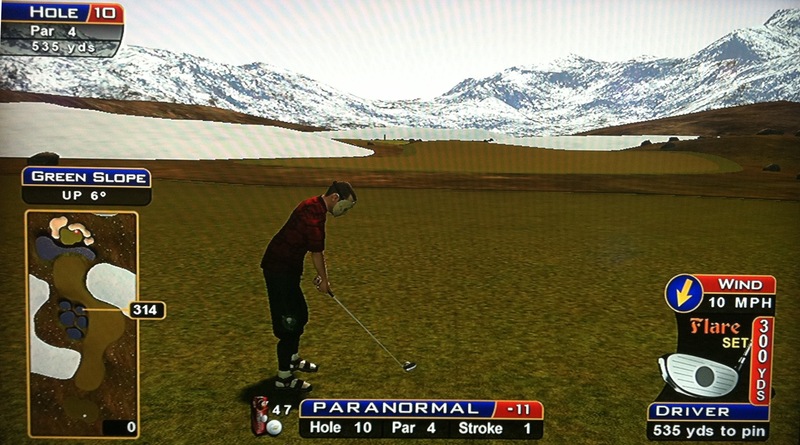 After polling several of the experts, there are three different ways people choose to set up for Golden Tee Live 2008 Summit Lakes. Three different options are presented towards playing Summit Lakes. The most popular choice is to use the old hybrids (”old birds”) and the orange balls. The next most popular option is to use the low-loft (FTX) clubs and the D2 (high-spin) balls, and another smaller crowd prefers to use the low-loft (FTX) clubs and the orange balls. Of course, the choice is yours, but it’s helpful to know how the pros set up to play Summit Lakes! 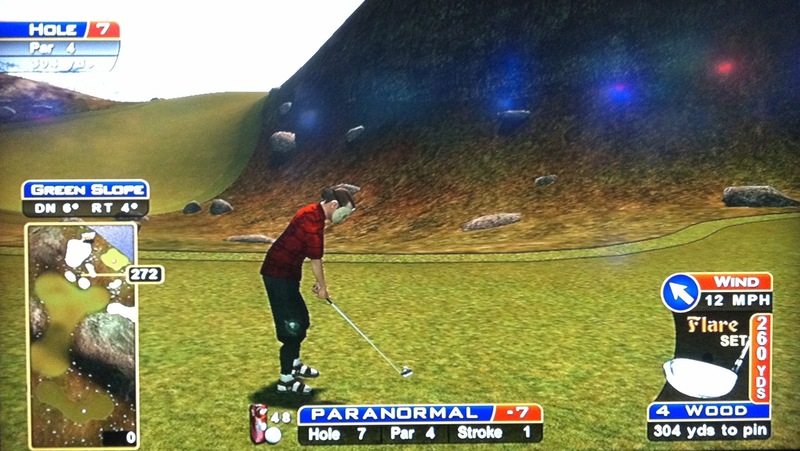 An easy par 4 to start, as usual – just try to position your tee shot with a straight-in wind so that you have the best chance of holing out your approach shot, or at least getting Great Shot Points! Here’s an example hole-out. It’s always easy to turn left once and pound an A1 with roll for extra distance. This par 3 plays slightly uphill, so above all else, make sure you don’t leave it short in the water! Here’s a backspin hole-out to a front pin, and here’s an example hole-out to a back pin. 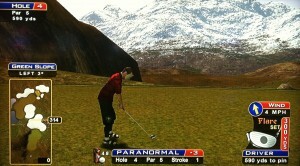 Here’s an occasionally drivable par 4. If the lake is frozen, be glad, because most of the water the rest of the way will be too! The round will play much easier than if the water is in liquid form. From the front of this huge tee box, you can get to the green with a big tailwind and an A1 that will bounce off the ice and onto the green. If you’re close and have a good wind but the lake is not ice, you can still get close to the green for a chip if you turn right and hit a C3 (a lucky topspin bounce could land you on the green this way as well…check out this incredible ace!) If your tee shot accidentally rolls into the snow, it will sit up, and you can still usually get there in two (remember backspin won’t work as well) — here’s a dunk from the snow! The safe approach works too – there’s no reason you can’t lay up at the end of the first fairway and hit your approach into the green from there! But you usually can hit a straight B2 driver over the snow and into the bottom fairway as well. 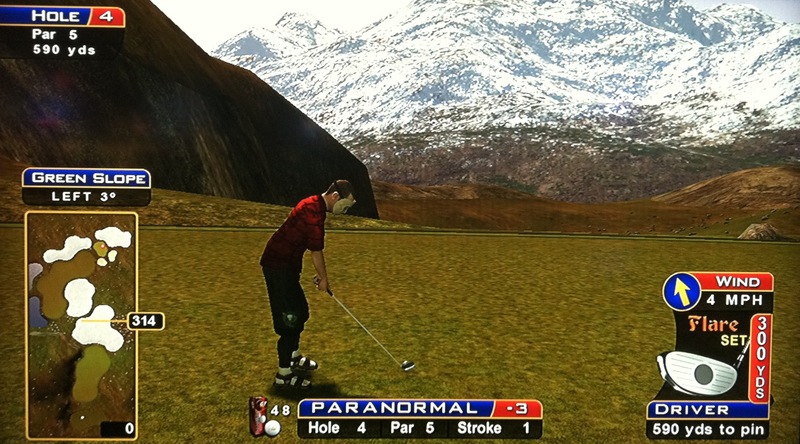 On this par 5, you should always be able to reach the bottom fairway off the tee. Don’t worry about clearing the mountain either – even a low-loft driver with roll will go straight over the edge of the mountain. Simply turn left until you are lined up to land in the rough between the snow and water down below. Crank a hard, straight B2 drive with roll, and your ball will roll out of the rough and into the fairway. If you’re comfortable with your C3, that gets down there easily too. From there, you should have a nice approach shot into the green for an eagle putt! Here’s a hole-out with a 5-wood. Even if you get into the far snow mound, you’ll still have enough to get there — here’s another hole-out. Don’t take this tee shot for granted – make sure you end up in the middle of the fairway, because there’s trouble right and left! Stay in the middle and you’re in good shape to birdie. Here’s an example hole-out. This shot is tough because the wind affects it so much. Play one less club because of the downhill shot, and compensate for the wind more than usual since the ball will be in the air longer! Here’s a great floater to a back pin. This par 4 is drivable 90% of the time. The left side of this tee box is money – hit a straight wood with backspin to the green. Here’s a nice 3-wood down and in! From the middle of the box, you’ll need to hit a B1 or a small A1 around the mountain to get there. Here’s a nice cut-shot around the mountain for an ace! The right side of this box gives you trouble. 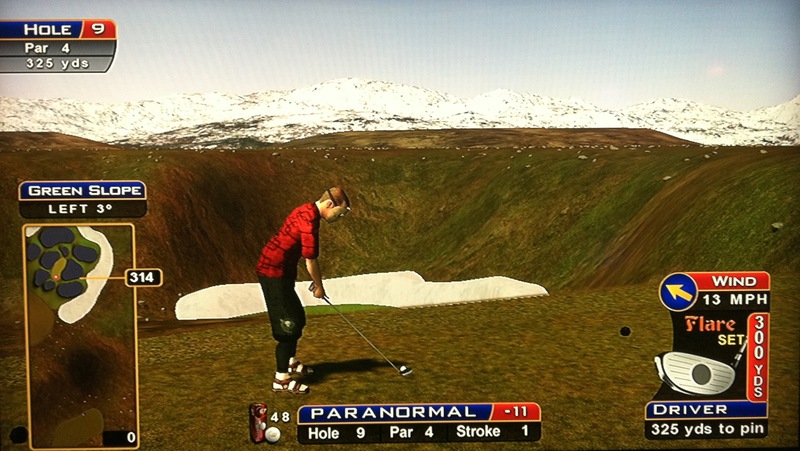 You can try to hit a topspin driver off the mountain and try to get lucky, but watch out – you could go into the water past the green. 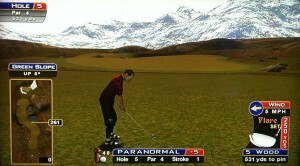 And, if this happens, it will put you back on the tee box! To reach this par 5 in two, you’ll have to get on or past the little bottleneck between the fairways. Of course, there’s trouble on either side, with water on the left and nasty rough on the right. Normally, you can aim at the right small path along the lake and hit a big C3. Assuming you clear trouble to the fairway, you’ll have an iron to driver shot into the green. Here’s an example hole-out. The shot here, though, is most often turning left and hitting a big A1 with roll. This is a classic example of where the ball will skip across the water even if you come up short of land when it hits. If you don’t think you can clear the first fairway, laying up is much better than being in the water or the nasty rough. 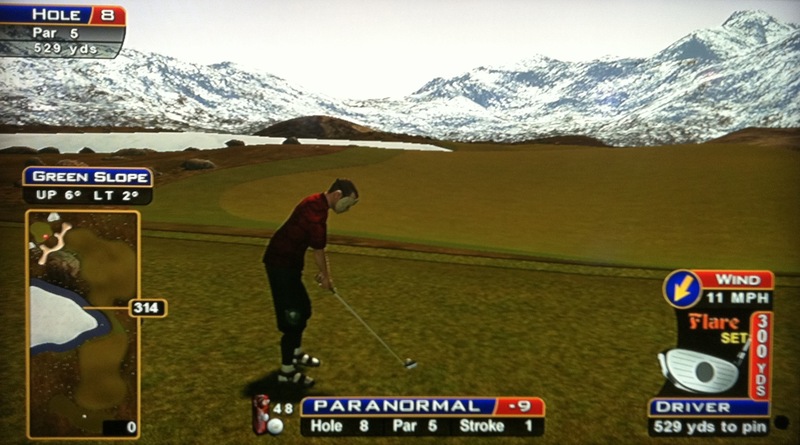 Or, from the front of the box, you can aim at the flag and blast the ball straight ahead into the snow (a low-risk option). The elevation will be low, and you need as much distance as you can safely get, so pound it out there! Even when the ball plugs, you can still get to the green on your second shot. This is a good option if you’re a beginner and don’t trust your accuracy over the bottleneck. This par 4 is drivable a lot of the time. If there’s ice, it’s that much easier. Just go for it and don’t worry about getting wet. 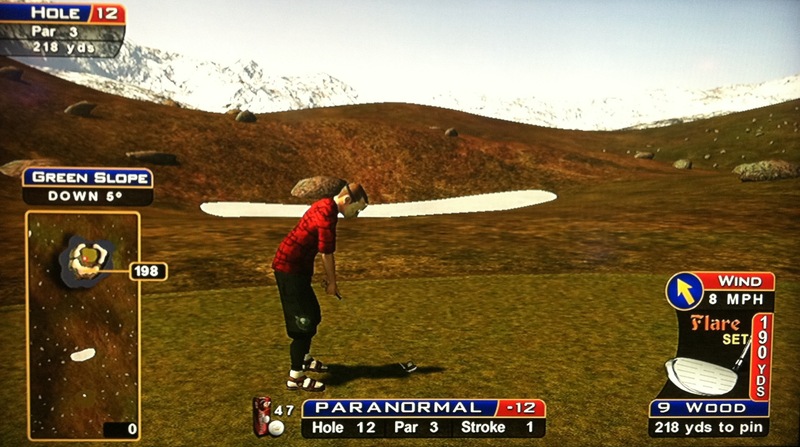 Or, if you can’t get there, line up with the wind for a straight-wind approach shot from just about anywhere. Without ice, you may have anywhere from a straight shot to a big A1 or C3. Here’s a nice driver hole-out. And one more perfect shot with a slight tailwind. With a tougher setup, here’s a great A1 drive that finds the hole! Sometimes you could be into a huge wind from the very back of the box. You can’t get there with this setup. Lay up in the snow below you, but make sure you hit the flyby button a few times to check out the terrain. The snow has mounds and you won’t be able to get there in two if you get stuck behind one. Remember that this green is WAY downhill, and the wind will REALLY blow it again. Your ball will be coming straight down from the tee even with a driver. A strong face-wind makes it really hard to hold the green, so definitely don’t use backspin with this setup (try to land long). The fairway is separated in two here. Most of the time, you’ll just want to lay up toward the end of the first fairway, which will leave you with an easy 5-wood to the green. Here’s a hole-out from in front of the snow. If there’s a big wind and you’re at the front of the box, you can get to the second fairway pretty easily, where you’ll have a nice iron shot in. When in doubt, lay up short, because distance on the approach shot won’t be an issue! You’ll often have a 5-wood into the green, so make sure you read the wind and slope correctly to get near the pin on this sloped green. It’s rumored that this green has been driven once or twice when the lake is ice, but you probably won’t be thinking about that! If this hole is icy, though, blast an A1 or C3 as far down the ice as you can, leaving yourself with a nice approach shot with the wind. Here’s a nice hole-out from the ice! 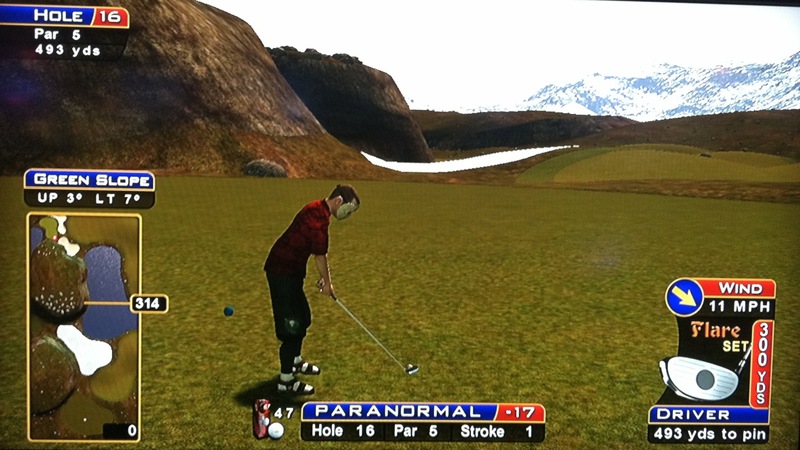 If the lake is water, lay up on top of the hill on either side (whatever gives you a better approach shot with the wind). You should then have from a 2-iron to a 3-wood from there. Here’s a hole-out from the fairway. On your approach shot, if you’re using a low-lofted club, it also works well to apply backspin and land the ball in the sand short of the green. It’s flat, so it will hop out of there and creep up nicely towards the pin! This hole is really tough. Adjust your club because of the elevation change, and whether or not to use backspin depends on the wind. You’ll probably have to fight the wind here with some kind of angled shot, but if you’re off just a bit, you’ll be in the sand or worse. Good luck! There’s another tee box where you shoot uphill at the green — this shot got a nice bounce up and in! The shortcut here is to rotate to the right a few times and try to land the ball on the green patch in between the cabins. If it looks tough, it is. If you can stick it here, though, you’ll have a wood into the green for eagle. Don’t be long over the green, though, because it’s out of bounds there! Going down the island fairways will mostly never get you there in two, but it’s a good way to lay up if you’re 350+ to the cabins into a big wind and there’s no ice. 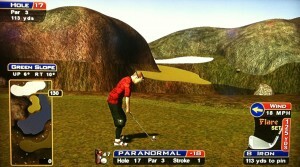 You may as well try a big A1 with backspin, hoping to get lucky and stick on one of the island patches. Here’s a hole-out from there. If there’s a good wind, or you’re close enough on the box, you can blast a drive over the cabins into the snow. 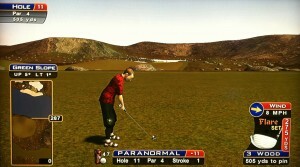 You should still be able to reach the green in two from here also, and it doesn’t require a precision drive! Here’s a hole-out from the snow. Finally, if the lake is ice and you have a back tee box, don’t be afraid to crank a drive onto the ice just left of the cabins. You may be able to reach the green in two from here as well! This hole is always drivable over the rock. If you’re close enough to be able to use a 3-wood, it will clear the rock. A driver will usually hit the top of the rock, but it will bounce over. If you have to hit driver, use backspin and aim for the right side of the green. The rock will kill the backspin, but the ball should bounce over the rock and trickle down onto the green — this is how you draw it up! Sometimes you will plop into the snow, but you’re still in good shape there. If you do end up on the hill looking down at the green, remember that you can putt off the hill! Here’s an amazing deflection that found the cup! 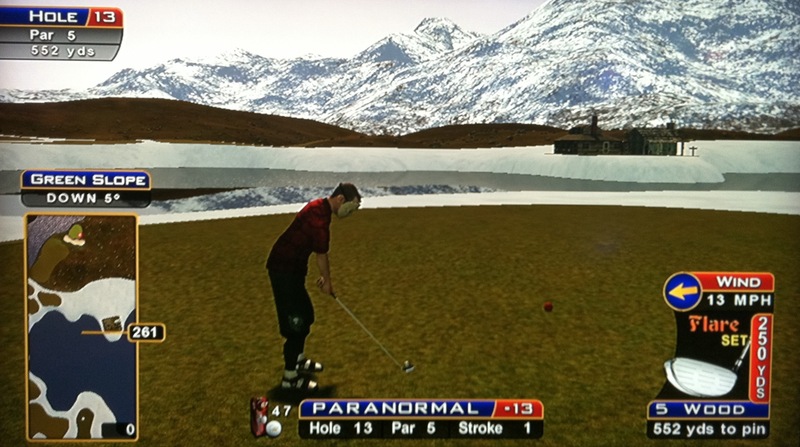 If this hole is icy, you can get close to the green, even maybe making it with a couple lucky bounces (be careful for some of the ice holes, because there’s water still in a couple). This hole usually plays tough because of the wind and a downhill shot into the green. Try to leave your approach shot straight with the wind. 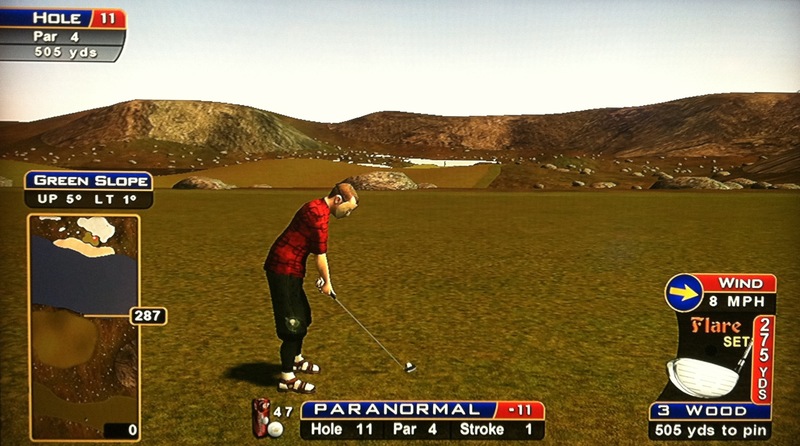 Here’s a great hole-out from the fairway. 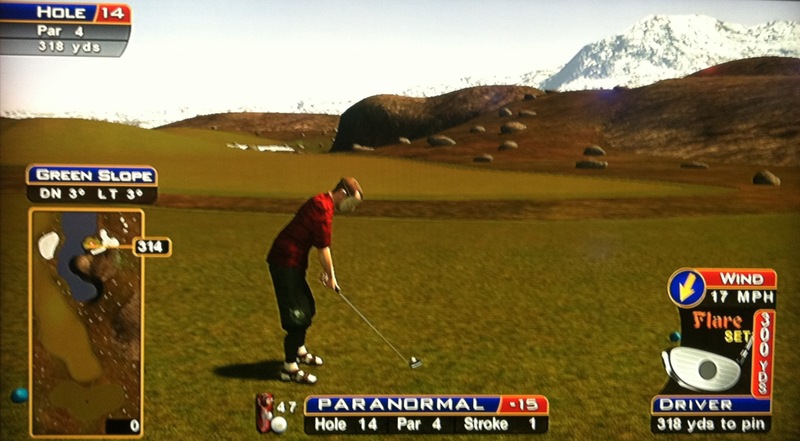 Sometimes, it’s best to place your drive straight ahead onto the rock, depending on wind and pin placement. Don’t be scared to do this if it gives you a better approach shot! A good rule of “thumb” here: When hitting from the rough with a wind in the teens blowing from behind, you will want to hit a club whose normal distance (ex: 9-iron = 100yds) will land the green, and hit a full thumb shot (no pullback). If you’re into the wind, you will need to club up 1 or even 2. 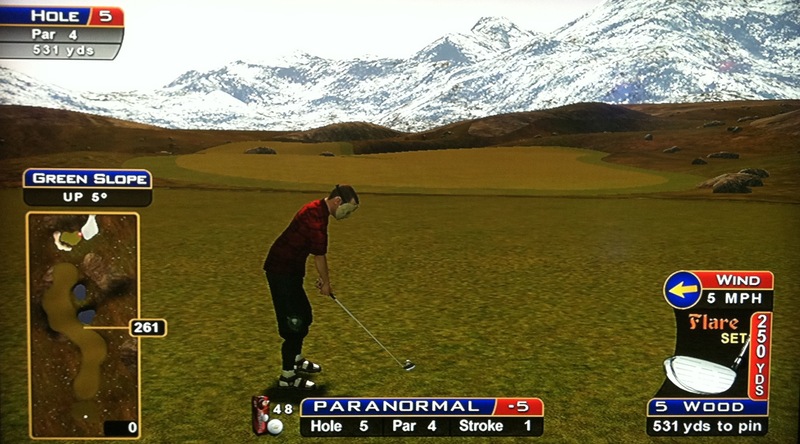 Your first decision will be whether or not you can reach the second fairway here, which may require a monster C3 at times (and other times it’s easy). If you get across, you have a good shot at eagle. If you’re on the back of the box and into a wind, don’t try it unless there’s ice. If there is ice, just blast away, because you can probably get there in two from the ice. 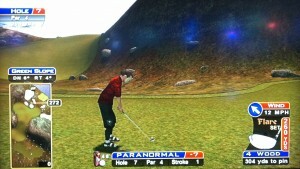 Remember that if you can almost get to the second fairway, you can probably skip it across using an A1 shot with roll! Here’s a hole-out after a long drive. If you do have to lay up, check if facing the green shows any wind to the left. 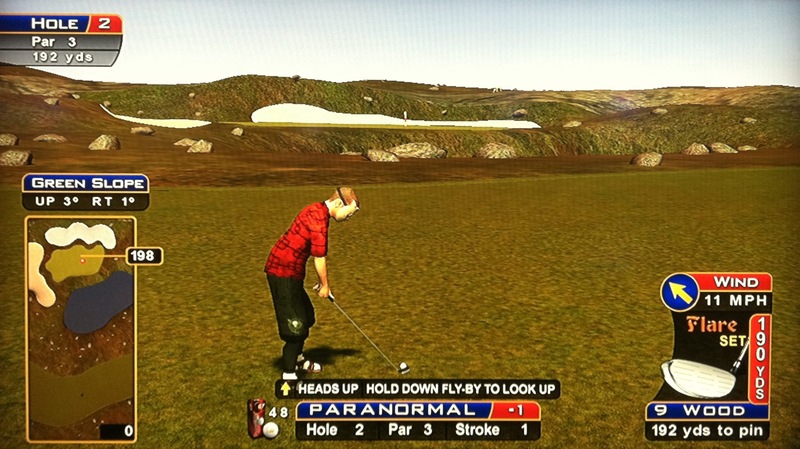 If so, lay up on the first fairway toward the left side, close to the water. From here, it’s 360-400 to the green, but you can get there in 2 with a big C3 topspin and a couple lucky bounces. Also from the back box, if the wind is going to the right at all, click one left of the green and notice the green landing zone in between the mountains. 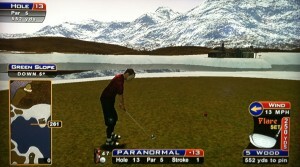 If you stick this, you will have a big A1 5-wood to the green (don’t go this way if there’s water, only if there’s ice. That way, you’ll still get birdie if you mess up and land on the lake). 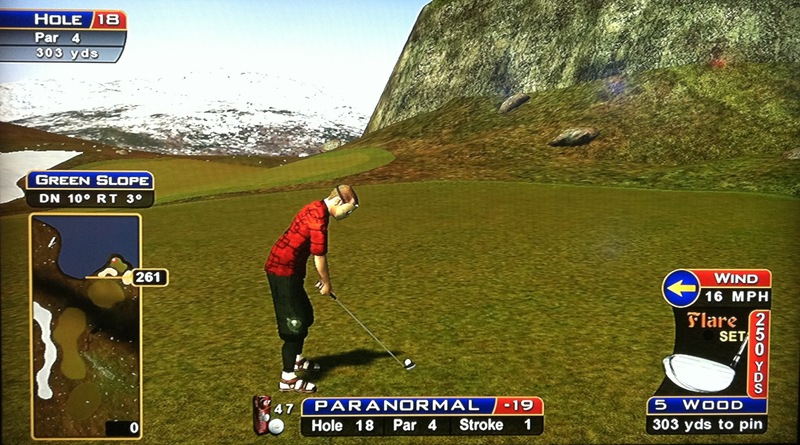 Additionally, while trying to stick a landing spot with a big slope, don’t use backspin or topspin, as the ball likes to keep bouncing all the way off and into the water. Finally, you can land up top on the hill to the left, but on your approach shot, watch out for the moose! In some cases, you can actually get to the top of the second hill! Here’s a hole-out from there. A very tough par 3 with thousands of looks. A big wind is absolutely brutal here, as it will blow a shot from your high-lofted club all over. Pray for ice here in case you don’t make it on. 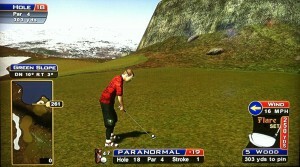 And even if you do make it, watch out for a down 10 putt because it will still roll over if you’re not careful! You normally won’t want backspin here because of the up 10 slope. Sometimes you can use the hill to stop your ball instead, but don’t hit the hill too hard or you’ll ricochet back into the water! 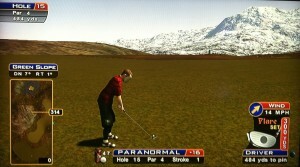 You may also consider just landing in the snow if there’s a back pin. 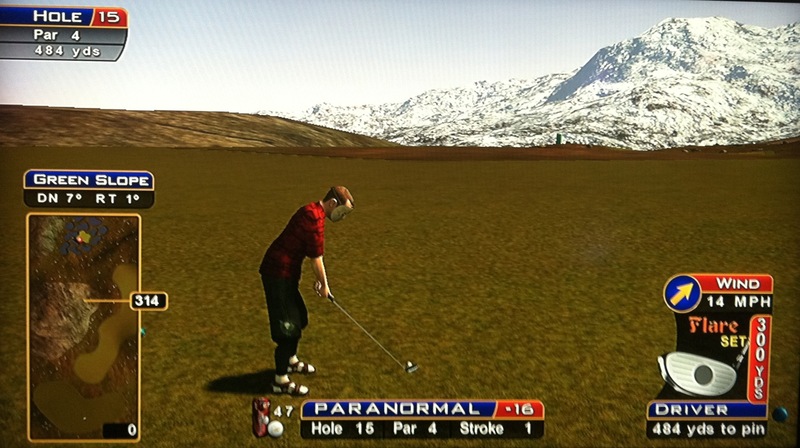 Par is a good score here. Good luck! Check out this dunk to a right pin! 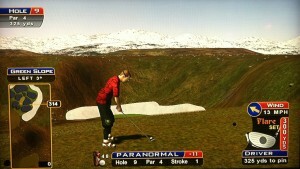 Here’s a perfect cut shot into the slope. This one flew high to the right side, playing the wind perfectly with the 9-wood. This one used the rock perfectly to roll down and in! Summit finishes with an almost always drivable par 4. From the back of this box, a 5-wood will go straight over the mountain. 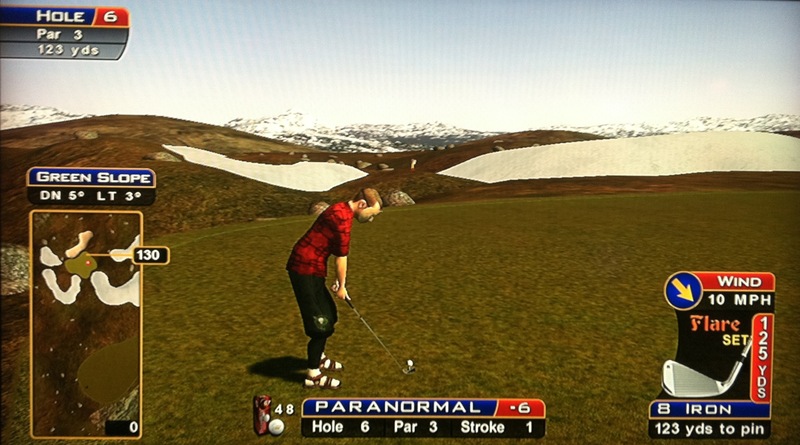 Most times, though, you will have to curve it around the mountain with an A1-type shot with backspin and hope for a safe landing on the green. Here’s a great 3-wood ace. 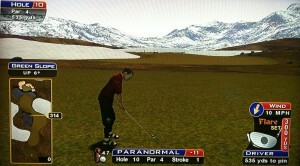 Ice really helps you attack the green here. 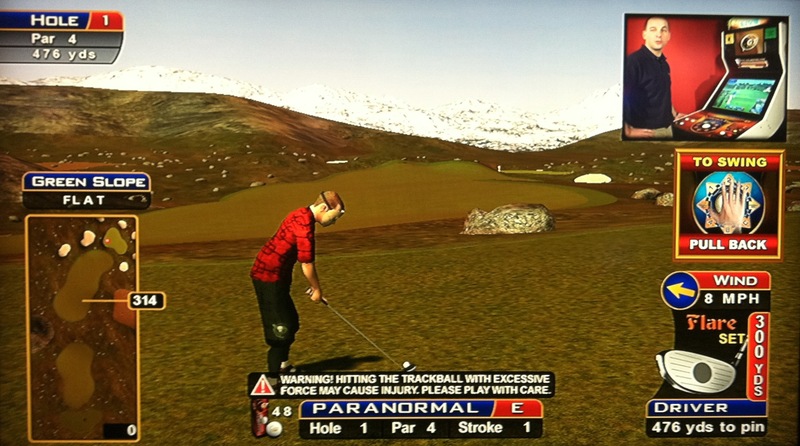 Remember that playing a lot of hook adds distance to your tee shot, and make sure you account for the exaggerated wind!